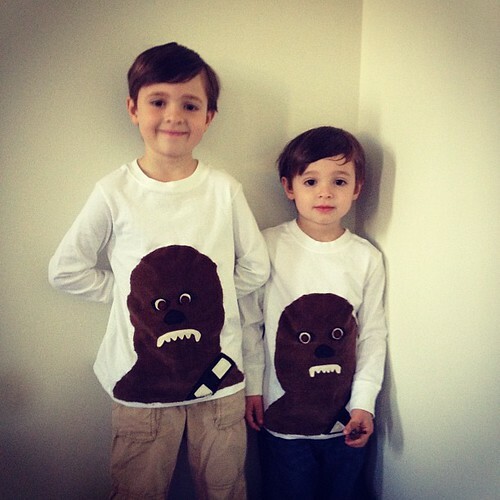 As soon as I saw Dana's post yesterday, I knew I would be making my boys Chewbacca shirts, pronto (and stuffies very soon, too!). The boys have been watching the Star Wars movies for the last couple weekends and last night The Empire Strikes Back was on cue. I watched a little with them and then left them with their dad while I rounded up some brown minkee, felt and t shirts. I was not super happy with how they looked, especially the eyes, but the boys were thrilled. I decided to add shoulders so I could have a bit of Chewie's trademark ammo strap showing. I also just zig zagged around the edges to keep them from fraying, rather than sewing a "back" to eliminate raw edges. We'll see how they fare in the wash. The boys could not wait to put them on this morning, so that is a success in my book. I think up next is R2D2!